A key part of Intentionally Vicarious host Todd Youngblood’s strategy for having more fun than anyone else he knows is to make “work-life balance” an utterly meaningless, useless phrase. He thinks that if you need to worry about such stuff, you need to CHANGE-JOBS-NOW! Take a look at the picture to right. 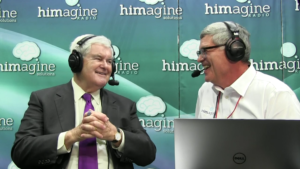 There’s Todd interviewing former Speaker of the U.S. House of Representatives, Newt Gingrich. He’s at work and obviously having fun! He for sure was not the least bit concerned about “work-life balance” when this photo was taken. Was he at work? Yes. He was hosting himagine Radio for his client himagine Solutions at the 2017 American Health Information Management Association Convention in Los Angeles.